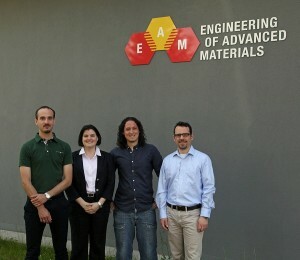 Novel light sources, computer-designed break-resistant materials, efficient energy conversion, and new types of hybrid materials: researchers at FAU’s Cluster of Excellence ‘Engineering of Advanced Materials’ (EAM) work on trailblazing ideas. With its funding scheme, the EAM Starting Grant, the Cluster of Excellence aims to support its most promising young researchers. This year, four young researchers have been awarded a grant of 100,000 euros each, allowing them to advance their projects. ‘The first years after the doctorate set the course,’ says Professor Dr. Wolfgang Peukert, co-ordinator of the Cluster. ‘Young researchers have to gather experience, research, publish, build networks, establish themselves. So far there are hardly any funding schemes for this career phase, however. This is where the EAM Starting Grant comes in.’ This year the Cluster has awarded a total of four EAM Starting Grants. With altogether 10 grants in its funding period from 2007 to 2017, EAM is investing a million euros in its young researchers. ‘We see the EAM grant money as start-up financing to get individual projects underway,’ explains Professor Peukert. ‘This increases their chances of success when the excellent scientists have to apply for funding from national and international sources.’ Prof. Jana Zaumseil and Prof. Ana Smith are proof that EAM’s strategy for promoting young scientists works: Jana Zaumseil was appointed by FAU as part of the EAM award programme, Prof. Ana Smith was awarded an EAM Starting Grant in 2011. Both scientists have received much sought-after funding from the European Research Council in the past two years: an ERC Starting Grant. This award is endowed with 1.5 million euros over 5 years and allows scientists to expand their research groups. Whether a material is brittle like glass or exhibits ductile behaviour under pressure, i.e. undergoes plastic deformation, depends on its atomic bonds and the arrangement of defects around the crack tip. This microstructure depends on the previous history of the material. Depending on its pre-treatment, a material with the same chemical composition can either take a given load or not. The goal of Erik Bitzek’s research is to explain the interaction between cracks and defects. To do so, he uses supercomputers to simulate the movements of several million atoms around the crack tips. These simulations form the basis for models with which fracture behaviour can be described more closely. Such models are important for crash simulations in the automobile industry, for instance, or to calculate the fracture strength of irradiated nuclear reactor steel. Researchers want to use their understanding of how cracks and the microstructure of a material interact to develop materials that are even more break-resistant. Carbon-neutral generation and use of energy requires efficient conversion of the three forms sunlight, electricity and fuel. These conversion processes that take place in solar cells, batteries and electrolysers are based on the exchange of electrons at the interfaces between two materials. This is where Julien Bachmann comes in: he wants to make conversion processes more efficient and models his approach on nature. Thanks to optimally configured structures on a nano scale, leaves are highly efficient in converting sunlight into energy. Julien Bachmann’s project aims to structure materials for solar cells, electrodes and lithium ion batteries on the nano level in a way that allows for control over and improvement of interface geometries. In order to achieve this, Bachmann wants to make components more efficient, but also examine which physical and chemical processes limit the performance of the components. This project examines the interfaces between organic molecules and tailor-made thin films. The layered hybrid materials, consisting of organic and inorganic parts, have fascinating electronic properties which can be used for a new generation of optoelectronic and molecular electronic components such as solar cells. The planned examinations with a high-resolution scanning probe microscope are supposed to help researchers understand the properties of different structures on the atomic level, thus forming the basis for better high-performance materials. Researching novel light sources is Dr. Rubén Costa’s goal. His work focuses on light-emitting electrochemical cells (LECs). They are related to the organic light-emitting diodes (OLEDs) that are used in many screens already. Such LECs could be the basis for large-area luminous wallpapers in the future. The advantage is that LECs have a simpler design and are overall cheaper to produce. However, the raw materials used so far are expensive. This is why Rubén Costa is searching for suitable affordable materials with a sufficient worldwide occurrence. These materials have such exotic names as ionic fullerenes, carbon nanotubes, graphene quantum dots and porphyrins. They are examined with regard to their suitability for use in LECs, especially when it comes to the red wavelength range, for which solutions are still lacking. 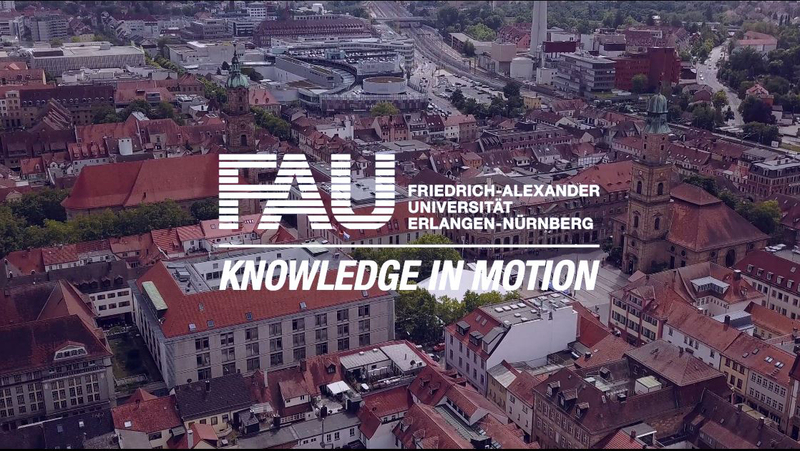 EAM is an interdisciplinary research association in which researchers from eight science and engineering disciplines (physics, chemistry, mathematics, materials science, chemical and biological engineering, mechanical engineering, electrical engineering) work together at FAU. This wide range of disciplines is also reflected in the awardees. There is a common denominator to all their research ideas, however: how can new, tailor-made high-performance materials be produced – on the atomic and molecular levels and with completely new material combinations and structures?